We planted succulents in our terrarium. We picked different shapes, colors, and sizes. Succulents need very little water. A terrarium is like an aquarium, but for plants instead of fish. It is made in just about any glass container. It is planted to look like a miniature garden or forest enclosed in its own little world. You can easily make a beautiful terrarium yourself. First, you want all the plants to thrive in the same kind of environment. For example, you could plant all succulents (including cactus), because they need very little water. Or you could plant all ferns, because they like it moist. You could put moss with the ferns, because moss likes it moist too. If you put a fern with a cactus, one or the other might not do well (the fern if it gets too dry, the cactus if it gets too wet). You can use an open container or a closed container. An open container is best for succulents and cacti. They like lots of air. A closed container (with a lid) might be best for ferns, ivies, and begonias. They like it humid. But if you see a lot of water condensing on the lid, remove it for a while, then replace it. Clear glass container. For example, aquarium of any size, goldfish bowl, cookie jar, pickle jar, vase with a broad bottom, brandy snifter, or even a shallow dish with a glass bowl turned upside-down over it. Small plants of different colors, shapes, & textures. Try to get miniature plants that aren’t going to grow too big for the container. Fun décor, like tiny pine cones, shells, ceramic animals, or a garden gnome. Make sure your glass container is clean and shiny. The layers of rock and soil are part of the beauty of your terrarium. Start with a layer of rocks, about one inch or so, at the bottom of your container. These will help the soil drainage, so the roots of your plants won’t get water-logged. Add a 1/2-inch-thick layer of charcoal. Fill the container up to half-full with potting soil. Plant your plants. When you remove them from their little pots, carefully tease the roots apart and remove some of the old soil so they will fit nicely in the terrarium. Arrange them to look nice. Leave some space for them to breathe and grow. Pat down the soil so they don’t get uprooted easily. 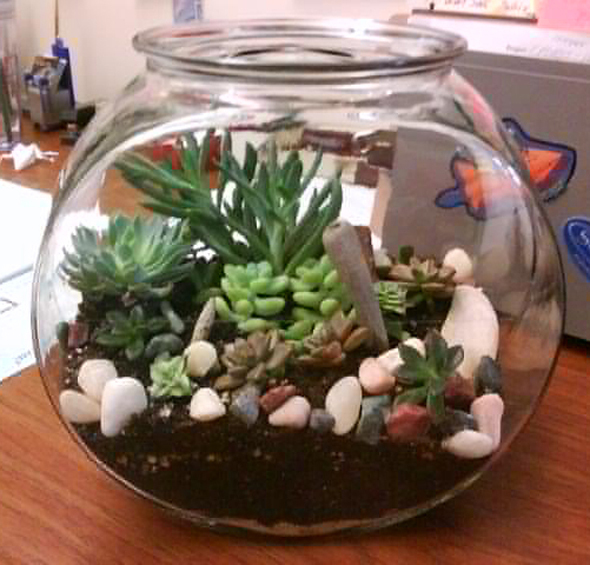 Add decorative pebbles, rocks, pine cones, or whatever to make your terrarium look like a little garden world. Water the plants, but not too much. Meet a "xeriscaper," a person who landscapes beautiful gardens that use very little water. A terrarium has its own mini-climate. The container has just a small opening or sometimes even a lid to completely enclose the container. That makes a terrarium like a greenhouse. Sunlight enters through the glass and warms the air, soil and plants the same way that sunlight coming through the atmosphere warms Earth’s surface. The glass holds in some of the warmth, just as Earth’s atmosphere does. Variety of shapes, colors, and patterns. Will the gnome take care of the plants? A garden in a cookie jar?